A child calls to his father after being pulled from the rubble of the Plaza Towers Elementary School in Moore, Okla., on Monday. 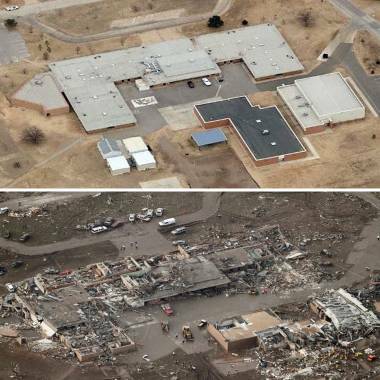 When the sirens began blaring and teachers at Plaza Towers Elementary School in Moore, Okla., heard that a monstrous tornado was roaring toward their 57-year-old school and its youngest students, there was nowhere to hide. They crouched in hallways and bathrooms, waiting, hoping and praying. Then "the school started coming apart," one neighbor who sought shelter at the school told the Associated Press. A teacher told NBC station KFOR that she draped herself on top of six children in a bathroom to shelter them. The massive twister scored a direct hit at 3 p.m. (4 p.m. ET), tearing off the roof of the mostly one-story public school, a cinder-block building that had no chance of withstanding shrieking winds that may have topped 200 mph -- the powerful outer edge of what the National Weather Service said was at least an EF4 tornado, the second-most-powerful rating. KFOR television reporter Jesse Wells reports Plaza Towers Elementary school was totally destroyed. Most of the walls of the school have collapsed, and cars were thrown into the front of the building. Emergency crews continue to look for kids who may still be inside. By Tuesday morning, the death toll at the school stood at seven. Officials said the children drowned in a pool of water at the decimated school. 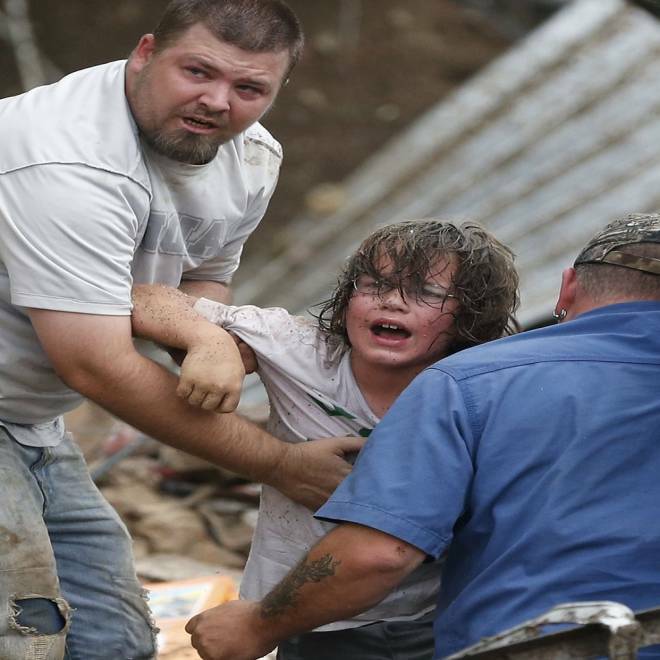 Rescuers were continuing to dig through the school’s rubble, from which several children were pulled out alive Monday evening. It's unclear if any other children were killed or trapped alive. Hysterical parents who had converged on the sprawling pile of broken concrete and twisted metal were later taken to a church to await word on the fate of their youngsters. The two-mile-wide tornado wiped out entire city blocks of Moore, the hardest-hit Oklahoma City suburb, killing at least 24 people, the state medical examiner office confirmed. Many of the dead are children. Exactly what transpired at Plaza Towers in the minutes before the tornado unleashed its destructive power has yet to be described. School officials evacuated fourth-, fifth- and sixth-graders to a church about a quarter-mile away before it touched down, but the younger students – kindergartners through third graders – remained at the 440-student school, according to KFOR in Oklahoma City. It was not immediately known why school officials divided the students. Before and after aerial photos of Plaza Towers Elementary School. But Mayer Nudell, a security and safety consultant, did not fault the decision to ride out the storm at the school. Despite the carnage at the school, “shelter in place” has emerged as a staple of disaster planning and the strategy of choice for a range of emergencies, including tornadoes. And studies show it has a good track record of saving lives. On May 3, 1999, for example, when another monster tornado roared through Moore, some 300 students and their parents were attending an awards ceremony in the West Moore High School auditorium. Though the twister badly damaged the school and tossed 150 cars in the parking lot like tinker-toys, those who hunkered down in the school’s hallways suffered only a few superficial injuries. But there are experts who say that having a large number of people crowded into a big building is a bad idea when maximum-force tornadoes are sweeping through an area. Chief among them is Joe R. Eagleman, a professor emeritus of the University of Kansas and author of “Severe and Unusual Weather,” a meteorology standard since it was first published in 1983. He agrees that there was likely insufficient time between the first warning and the time the tornado hit the school, constructed in 1966, for Plaza Towers administrators to consider sending students home. “If time is short, being caught out in the open is not good,” he said. But he said dispersing the students to their homes would have improved their odds. “If there is sufficient warning time, the homes would be typically safer because they are smaller buildings and offer more opportunity to get in a downwind corner of the likely approach,” he said. Eagleman is widely credited with debunking what was the prevailing school of thought on tornadoes for much of the last century: that the safest spot to take shelter is the southwest corner of a building. The reasoning behind the fallacy was that, since most U.S. tornadoes travel from west-southwest to the east-northeast, a twister would hurl debris into the northeast corner of whatever building it hit, likely taking out anyone cowering there. Witness Michael Welch captures dramatic video of a twister from a KFC parking lot in Newcastle, Oklahoma. But Eagleman conducted an extensive study after an EF5 tornado hit Topeka, Kan., in 1966, and found that the southwest corner – the direction from which a tornado was most likely to approach – was in fact the most dangerous area to hide. “It used to be a rule that the southwest corner was the safest, no questions asked, but it was not based on any data,” he said. In any case, students would have been moved into a hallway or small room away from the southwest corner of the building and any windows and instructed to either sit or crouch. Both men said the school’s construction would have been important to its ability to withstand a powerful twister. But given the destruction visible after the tornado swept through Moore, it’s possible that no building would have withstood the intense pressure that the tornado brought to bear on the building, Nudell said. Nudell also cautioned against jumping to conclusions about the emergency planning or safety of the school. “When you get a tornado like the one that it sounds like hit Oklahoma, sometimes all the preparation and planning in the world doesn’t help you,” he said. NBC News' Erin McClam and Tracy Connor contributed to this report.